Life memories to keep forever. What are your/their best life's moments? What's your life's best moments? 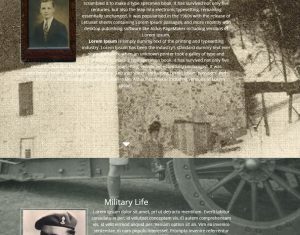 This example page displays shot biography text separated by each important life period. ex: childhood, career, sport, family etc.. It apply well for cases with more narrative text but not necessarily, it could contain just short mentions or quotations that depict well a life period for the person. In the example here, we inserted a background image that picture each life period. The background image could also come from our background image library. When you scroll down the page, notice how smooth and lively the text and image are both gradually displayed and roll on each other. This is an effect you can create just by selecting an option check box. This is one of the many advantage of such a good web editor. Click on image or here to see this live example. This page show how you can have a group or event memory page. The presentation is straight forward having each grade school group picture by chronological order. We could also have a presentation with a grid with let say 4 pictures by row. Whatever the choice, when you click on one picture, they are zoomed-In full screen and you can navigate from one to the other with the cursor or by clicking on the arrow. Click on image or here to see live example. 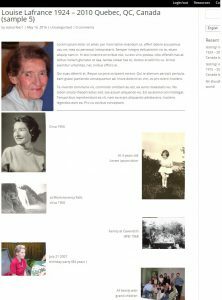 This is to show you that you can present a long memory page about any story or events. I this case it ia the story of Maria & Jean since 2003. There are no limit on the way you can display the presentation of pictures and texts.
. Click on image or here to see live example. 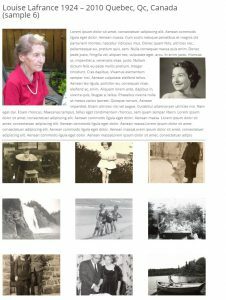 This is the same example as #2 but display the first page as full screen and especially we used a background image from our “Background Image gallery” to picture an eulogy quote from her children. Those pictures do not count in your limit of picture, it is free. You can add as many as you want. You can choose a background that depict better a text a quote or a period of someones life passion. Easy to realize with the basic editor, just. The picture gallery at the bottom is a snap to realize. After uploading your picture, you create a Gallery by selecting some or all your your pictures, order them click insert in the page, that’s it. It displays them automatically. When you click on one thumbnail picture it enlarge it full screen and you can navigate from one picture to the other. Click on image or here to see this live example. The basic editor is more limited when you want to do something more graphical than the picture gallery mentioned above in sample #6. But we can continue to insert freely and individually each picture, size it as you like and enter the amount of text you want. This would be useful if you have more description text to give to some images for example. This does not block you from adding a picture gallery at the bottom as well. Compare options to build yourself or have us create it for you. Expiry in 2 years + more limited but still good editor allowing full picture gallery & unlimited text. Possibility to order a presentation video (.mp4) (+30$). Allows you to play the presentation from any device without internet access. Possibility to order a presentation video(.mp4) (+30$). Allows you to play the presentation from any device without internet access. Possibility to upgrade to Designer Service later. Contact us and we will quote you. We will take into account all work you’ve done. HASSLE FREE! WE BUILD IT ALL FOR YOU or do it jointly with us or with the help of a designer. Includes the same as Professional Editor Option characteristics including the Eternity Club*. Includes a video (.mp4 file) of a slider presentation. Allows you to play the presentation from any device without internet access! (just mention you want it). We build the page for you based on our examples but adapted to your needs. 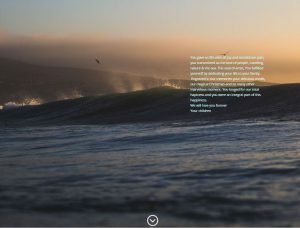 (may include an obituary, a picture gallery of all your pictures(100MB space), a slider presentation(up to 40 pictures), a music playlist of your choice, if needed, up to 4 homage pages similar to example #1 and finally a video file of the slider presentation. If you need more sophisticated or much longer presentation of what is mentioned above, we will be happy to build it for you at a competitive additional cost. ** On-Site means pictures or video that you upload to our server. Off-site pictures are uploaded on other album space site like (Flicker, DropBox, Google Drive, MS One-Drive…). In this case instead of uploading a picture you provide the URL like https://www.dropbox.com/s/a8ltozko4mnjdp3/DSC04421.JPG?dl=0 -do not forget to make your folder public. *** You can NOT put advertisement on your page or redirect to other site other that your personal picture providers as mentioned on the preceding point(**). In order to protect everyone from hackers we must pass all free pages through a review approval before being published. -You agree to never include commercial advertisements in your page or include content that can harm our web site technically or commercially. -You agree to never put content that promote hate or racism. -Although the web tool use is one of the best, you accept that it cannot do magic with bad quality pictures or not well aligned subject suited for a display in an horizontal landscape format, hence having truncated parts. Before ordering, you must be logged in. Note that Video presentation is offered in each payment button as a separate option or bundled with your option. NOTE: If you want to pay by CREDIT CARD, once on Paypal, check at the bottom, you should have a link or button for Credit Card. All taxes are included in the price. Choose the right currency option. receive document that analyze ways to archive picture memories - DVD - Cloud - FlashCard etc.. + creative ways to display your vacation & life's souvenirs. You will soon receive an email to validate your request by subscribing & then obtaining the download link.